The landscapes and portraits of Ryan S. Brown, now on display at the Covey Center for Fine Arts in Provo, are investigations into fundamentals of the natural world and human nature. “Observations from Life,” which ends November 30th, displays Brown’s ability to penetrate to the core of the subject of his work. “It starts with understanding your subject and interacting with it in a way that brings my experience with other people,” said Brown. Brown’s education at the Florence Academy of Art was grounded in the traditional academic system that stresses studies, in preliminary drawings or intense observation, as integral to the art- making process. Along with finished landscapes and portraits, the show at the Covey Center includes numerous preparatory drawings that are the framework for larger, finished works and reveal essential aspects of the process of Brown’s artistic investigation. Many of the works of nature are smaller in scale and might seem arbitrary or random but are in fact candid and frank renderings of the land that are as intriguing as a larger-scale work. In these paintings Brown observes the way water flows over a cluster of rocks or light pierces a grove of trees. 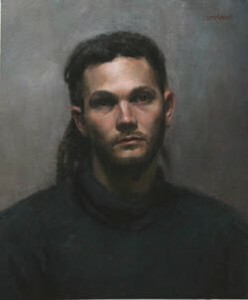 In his figurative works, like “Tommasso,” Brown investigates the human subject in order to express the sitter’s individual traits, manifest in candid emotion or mood. Regardless of what is being painted, Brown’s works are “observations from life,” and there is a sense of truth to what is being painted. Observations from Life is at the Covey Center for the Arts through November 30.